My porch has gone through so many different makeovers, but this is where it started. 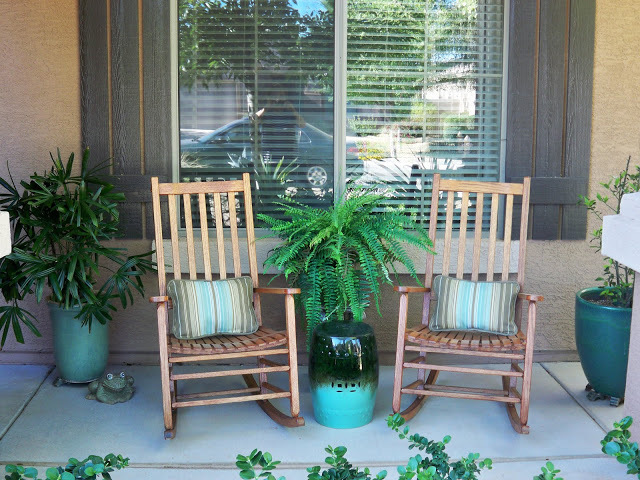 Two rockers from our old house that needed to be restained and a Big Lots garden stool that needed painting. Good basics, but boy, not very interesting. Restaining the chairs to make them nice and fresh was the first step, then painting that garden stool to give it some character was next. 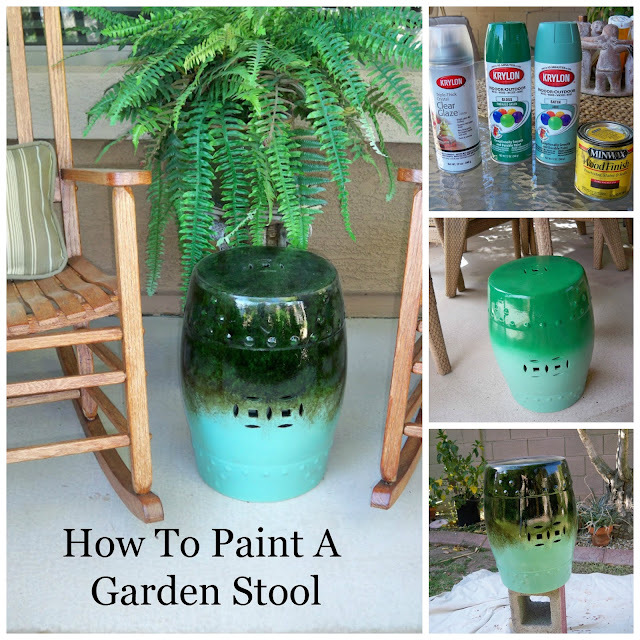 You can see my step by step tutorial on how to paint a garden stool here. Once the chairs and garden stool were redone, adding a couple of pillows and a fern went a long way to making the porch look inviting. Since then it has gone through a lot of changes. I have had some leopard on the porch recently - (I coordinated the leopard with the leopard I used inside) This was my easing into Fall look. Now that the temps are getting cooler, time to change things up a bit. gives this space a totally new look. 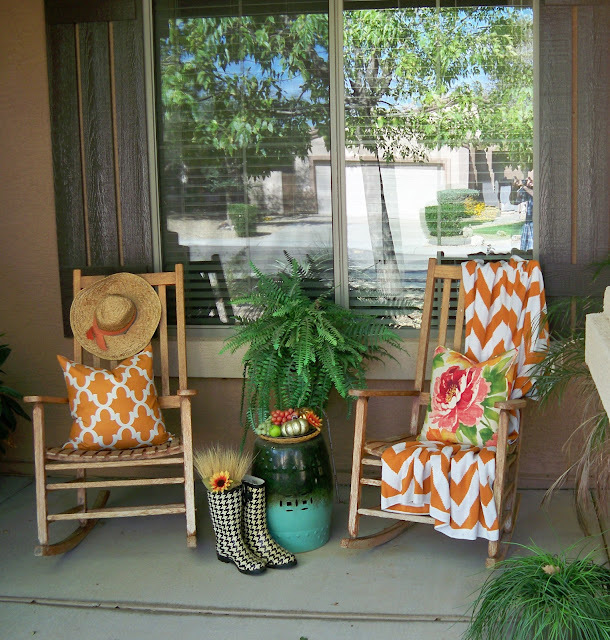 Since the plants are in bloom with little orange flowers now, I thought orange was a great way to tie the porch in. Plus orange always works well since our house is shades of brown. Sometimes I like to use the black plaid throw, but there are still a few touches of orange in those pillows. Just change out the pillows again and it seems fresh and new. Still using a little bit of orange. Christmas is always a fun time to play on the porch and celebrate the season. Last Christmas I used the plaid with a bit of red on the porch. Now, I have a few ideas brewing for this coming Christmas. Are you thinking of the Holidays too? 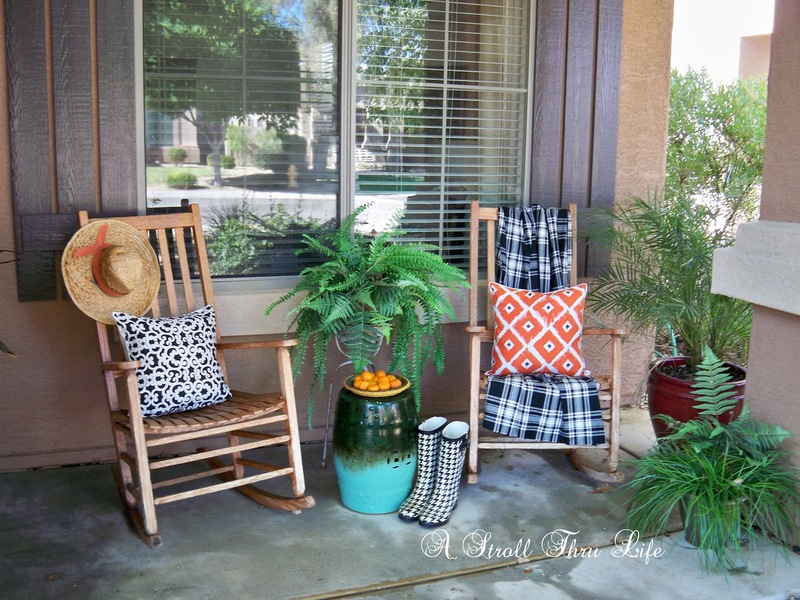 All it takes are just a few accessories, a couple of pillows and a throw and you can totally change up your porch whether it is big or small. Great post. I reviewed "How to paint a garden stool" post too and let me tell you this - there's no way I could achieve this 3D-jungle-like green you painted your stool with! Great job, Marly! 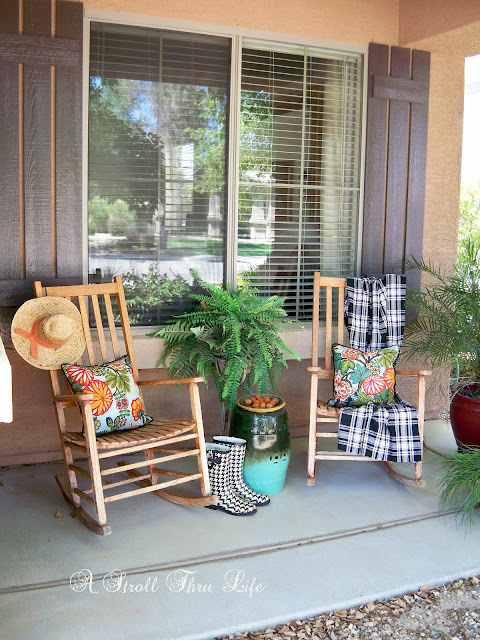 Your porch is so inviting. I made a crustless pumpkin pie with a oatmeal crumble topping and I'll bring it over if you'll put the kettle on for tea. We can enjoy your lovely setting. I see homes with no porch whatsoever and they look unfinished. We haunt our local Big Lots store and find all sorts of things. One of my favorites was a cute sign that says "Does running late count as exercise?". Lovely! I love to see all of your different variations. 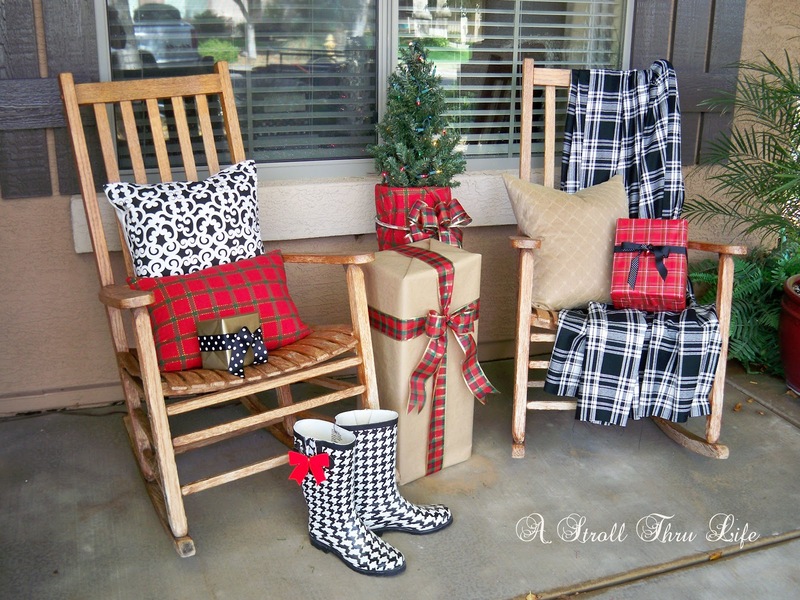 I think my favorite is the one with the black plaid throw and floral pillows. And, of course, the Christmas one is adorable! 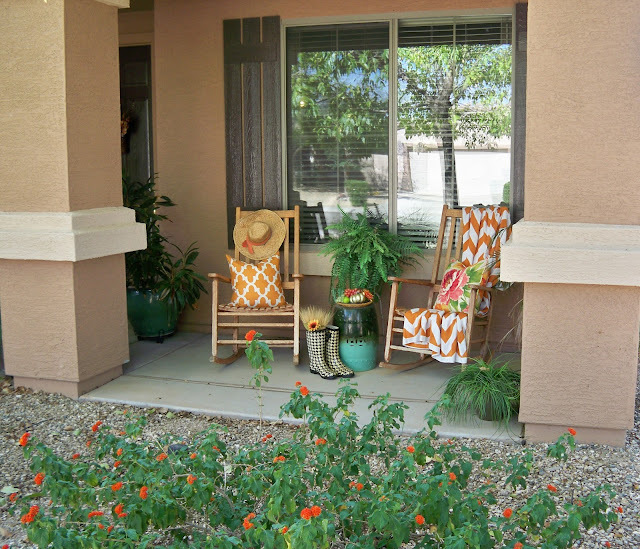 That was fun to see your porch evolve through the seasons. It's just the right sized of space. Love how you decorate your porch ...love the Christmas setting!!! You know, I did not notice the shutters until near the end of the photos. The decor changes really brought them out! Love the changes, especially the green pot. I love what you did with that garden stool! I would never have thought to paint it light that. You have real creativity, Marty. 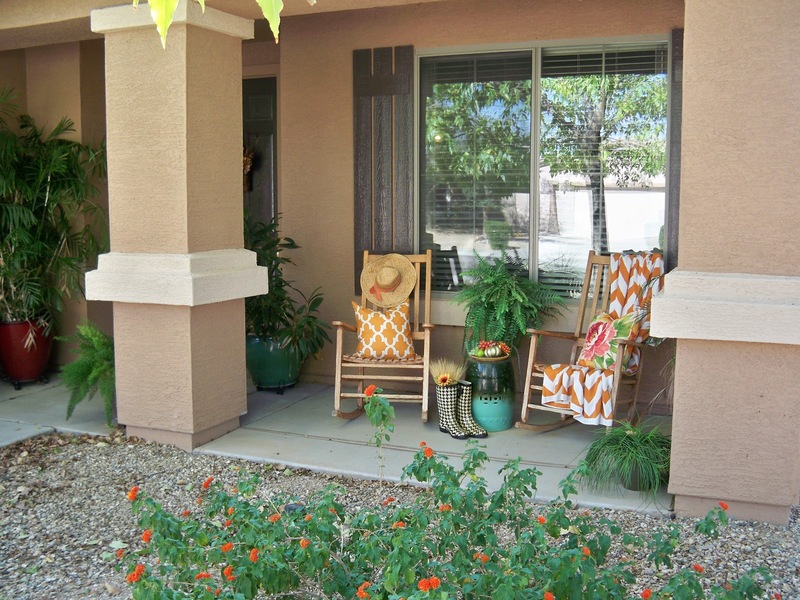 And the porch looks so inviting, I'm going to have to come visit! 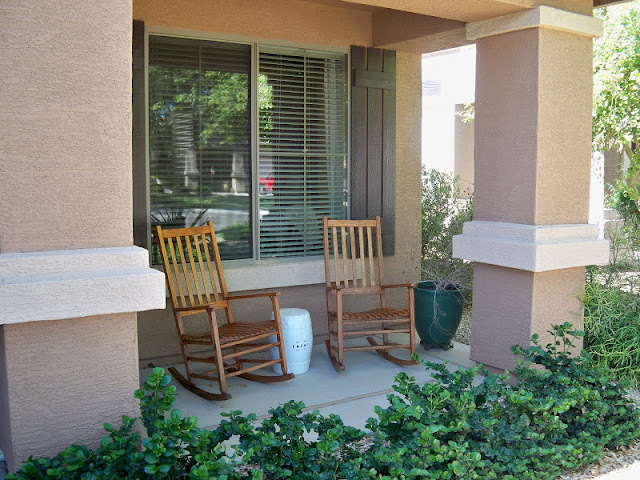 Love how you painted that garden stool - it looks a million times better! Your porch is charming - so welcoming. 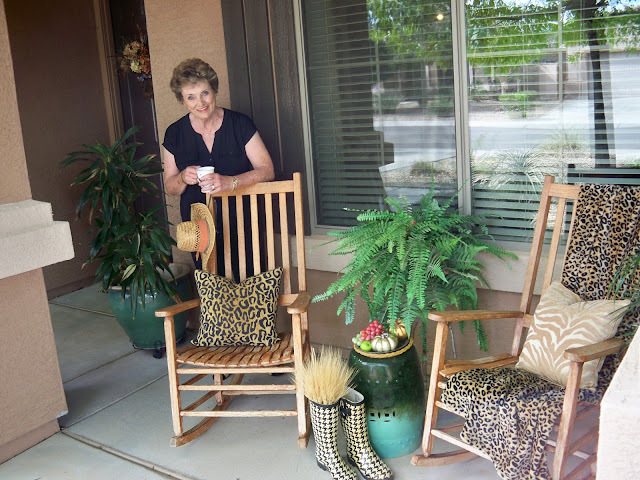 Gorgeous front porch decor, dear friend!!! LOVE how you switch the pillows for a "new" look!!! Your first Christmas porch for the Season is stunning!!! Loved the transformation of the front porch and the way you have played around with the pillows to give a new lovely look each time.